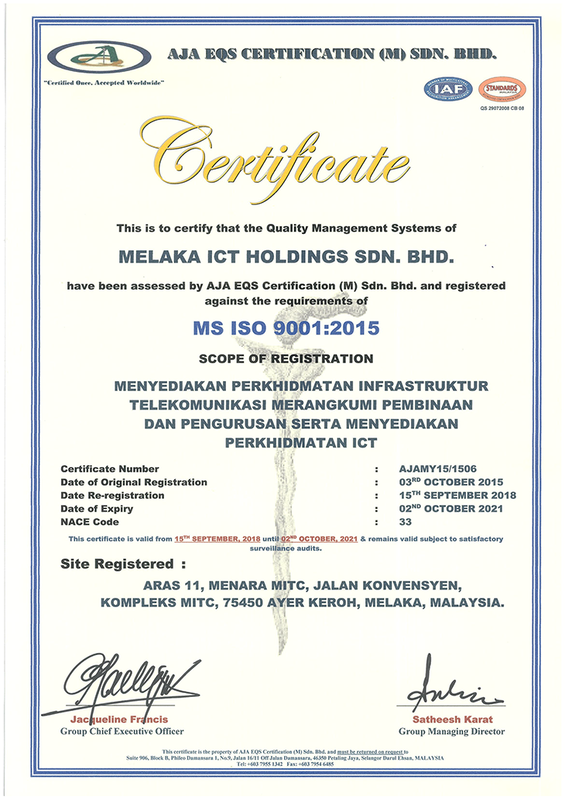 Melaka ICT Holdings Sdn Bhd (MICTH) is pleased to announce it has been recertified its ISO 9001:2015 Quality Management System (QMS) for the construction, erection and maintenance of telecommunication infrastructure and providing ICT services. The ISO 9001 QMS certification is an international quality management system standard published by the International Organization for Standardization (ISO). MICTH quality management system has been independently audited and verified by AJA as being in conformance with ISO 9001:2015. The standards are based on a number of quality principles including: strong customer focus, motivation and implication of top management, process approach in every department of the company, and continuous improvement of the processes. The recertification also demonstrates its’s ability to consistently provide products and services that meet customer and regulatory requirements, exceeding satisfaction levels. We want our current and future customers to know that our team is reliable, disciplined and committed in our endeavors. Successfully completing the ISO Recertification process is a testament to our passionate, fully-engaged team members.